The labeler model 700 machines are loaded with nice features; all stainless steel and aluminum construction, off-the-shelf components rather than proprietary boards and motors, a stepper-driven applicator and a standard Touchscreen interface on all models. All speeds on every 700 are synchronized together to avoid common labeling errors, and our Autoset bottle measurement and recipe system ensure easy setups and changeovers. 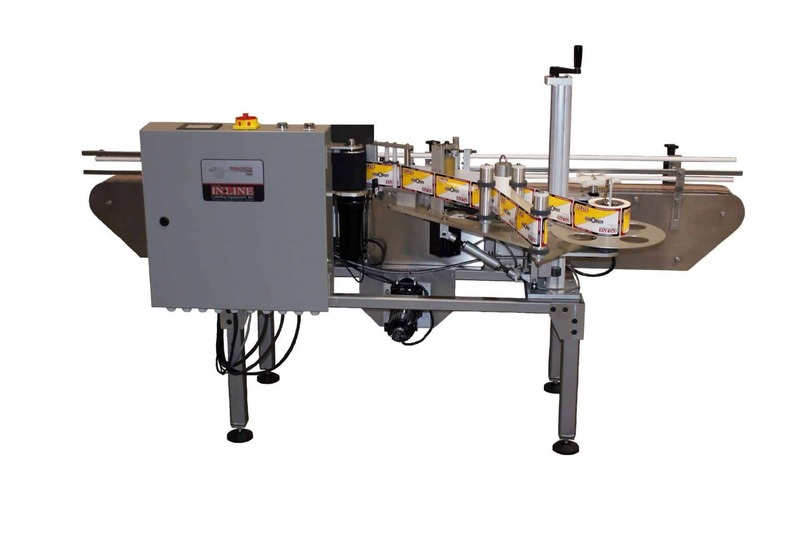 The Labeler Model 700 SP is a fully automatic and self-contained labeler designed to apply one or two body labels to round containers. Note that for two label applications (front and back) the labels must be alternating from the same web. This machine also is capable of applying clear labels. It precisely controls web feed and placement by utilizing Spin-in-Place labeling techniques in addition to a stepper labeling drive. Spin-in-Place means that the label starting point is referenced from the wall of the container instead of the base, which is generally a better reference point. 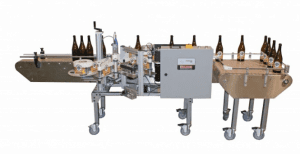 Gripper plates are designed to the bottle diameter for increased accuracy. Label placement accuracy is excellent on this machine. The Labeler Model 700 VS is a completely new shift from current designs. It can be ordered as one configuration now and easily changed in the future by replacing or adding bolt-on parts. 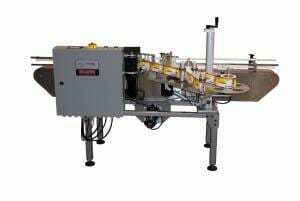 The conveyor height, width, and length can be reconfigured, along with the direction of the machine (left hand or right hand) and one of three labeling styles – wrap, spin-inplace, or trunnion style. So changing your line layout or the packages you run does not make the labeler you already purchased obsolete. Hot Stamp/Ink Jet Coder for lot/date information. “Gallon” upgrade for containers up to 6½”. Spacing Wheel for product separation. 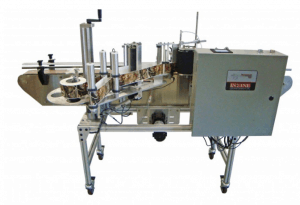 In the base configuration, there are features of this machine which make it ideal for microbrewery applications. 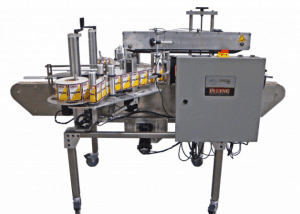 These include a built-in bottle accumulation table, star-wheel mechanism for proper bottle spacing for labeling, and an extended conveyor on the infeed end. 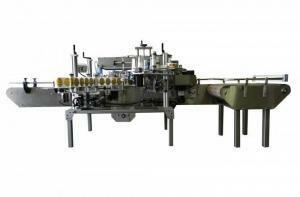 This makes the machine ideal for labeling either after filling or before filling. Hot Stamp Coder for lot/date info. Ink Jet Coder for lot/date info. Tall Label Kit for labels up to 7 ½” tall. Built-in Air blow-off for condensate. The labeler model 700 NR is a fully automatic labeler especially designed to be an easy machine to operate. It comes with a self-teaching label gap sensor that makes set up uncomplicated and trouble-free. Our new pinch grip design simplifies the way the web is threaded through the machine. Even though the 700NR Labeler is simple in its operation, the label application is still excellent. The machine has a high rate of consistency to 1/32” and a top speed of 1200 ipm. It is designed for non-round containers from 1” to 5” in thickness and for labels from 1” to 4 ½” tall and from 1” to 12” in length. Standard features on the model 700NR include the top hold-down belt, aligning belts for infeed, an ultra-fast PLC and accurate stepper-driven labeling applicators. Infeed Spacing Wheel powered by a separate DC motor. Gallon” upgrade for containers up to 6½”. The labeler model 700 NW is a fully automatic labeler especially designed to be an easy machine to operate. It comes with a self-teaching label gap sensor that makes set up uncomplicated and trouble-free. Our new pinch grip design simplifies the way the web is threaded through the machine. Even though the 700NW Labeler is simple in its operation, the label application is still excellent. The machine has a high rate of consistency to 1/32” and a top speed of 1200 ipm. It is designed for non-round containers from 1” to 5” in thickness and for labels from 1” to 4 ½” tall and from 1” to 12” in length. Standard features on the model 700NW Include the top hold-down belt, aligning belts for infeed, an ultra-fast PLC and accurate stepper-driven labeling applicators.